Topics: Student Mobility Matters, Re-entering Learners, Standalone, Learning Communities, and Smart Student Systems And Applications. 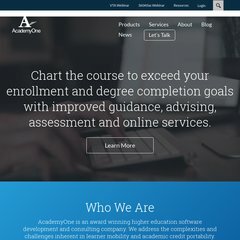 academyone.com INSTITUTE FOR THE STUDY OF TRANSFER STUDENTS INVITES INDUSTRY ..
academyone.com DAVID MOLDOFF, CEO OF ACADEMYONE INVITED TO SHARE EXPERTISE AT ..
academyone.com Frequently Asked Questions About SOAR Programs & Perkins Statewide .. The site has about 19 users daily, viewing on average 1.30 pages each. It is hosted by Directlink Technologies Center (Pennsylvania, Reading,) using Microsoft-IIS/7 web server. There are 4 DNS records, such as dns217.a.register.com, dns010.d.register.com, and dns021.c.register.com. The programming language environment is ASP.NET. PING (68.234.43.147) 56(84) bytes of data. A ping to the server is timed at 38.9 ms.